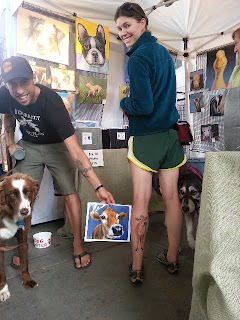 Again, same old story: This is a painting I did at the request of a customer at Portland Saturday Market. So, Dear Customer, whose name I didn't get, if this is your sweetie, I hope you like it. I've been painting a lot!! lately, and I'm enjoying it more and more. I haven't mentioned, I don't think, that I created a studio outside my house. It's tiny, but I enjoy it very much - and it's great not to have all my works in progress (and those that need to be done but haven't been started!!!) right in my face all the time. Now when I go to bed at night, I'm not tempted to jump up and rush over to the easel and make just one more tiny change in a painting. As a consequence, I think my paintings are becoming much more fresh and not so fussy as they have been in the past. I have a set number of hours I work in my studio every day (which I most often overrun the hours, but that's okay when I'm having so much fun), and then I can shut the door and have a normal rest of the day without having to think constantly about my work. The studio is really a large garden shed (8x16', I think it is) that I have emptied of most everything that was in it (and either got rid of what was there or consolidated it all into another shed I have). I've added only the essentials so far: my painting supplies, a radio, good lighting, my easels, my dog (when I'm in there), and a few reference books. But I don't even want much in the way of reference books in there because I want to go in there and work (play???) and have as few distractions as possible. So far, it's been working perfectly. I do still have to insulate the shed, though, because it gets pretty cold in there, and I don't want to have to run a space heater constantly in there. Insulation costs a lot less than running a space heater constantly. I finished this adorable guy last evening and think he came out pretty well. 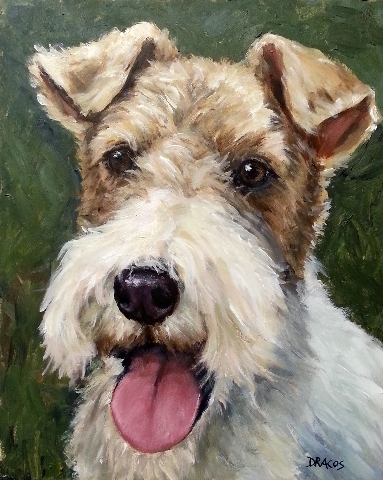 He's a wirehaired fox terrier, and I had gotten a lot of requests for one. A customer sent me a photo to work from, so, Dear Customer of Portland Saturday Market, here is your fox terrier. I hope you like it. Both the original and prints are available at either my Etsy or Artfire shops. The original is 8x10 inches and is painted on a gessoed mdf surface, one of my favorite surfaces to paint on. Today I'm working on Riley, the golden retriever, a custom painting. It should be an enjoyable painting to work on as I have myself had a golden retriever and know their general personalities and head structure. Painting dogs (and any other portrait painting, but especially dogs because of the varied hair covering) can be quite difficult: I need to know not only the underlying skull and skin structure of not only the specific dog but specific information about the particular breed of dog being painted, but I need to know the length of hair, how it lies on the head (and body in many instances), and even the general personality of the breed and as much information as I can get about the personality of the individual dog, too. 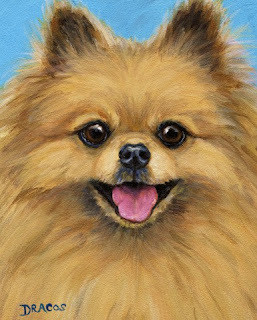 Most of my paintings are done from photos submitted to me by either custom customers or from customers from whom I've requested photos because I would like to paint their specific dog which they've either shown me photos or which they have had with them when I meet them usually at the market. (Wow, that's a really convoluted sentence!) Anyway, I usually don't get to meet the dog (or other animal) personally and have to rely on descriptions of personality, etc., and photos from customers. And sometimes I actually do take the photos of the animal myself if I get to meet him/her in person. But I've found that my customers often can get better photos of their pet than I can because they can get photos of them in their everyday lives or playing with a favorite toy, etc., something I can't usually get. 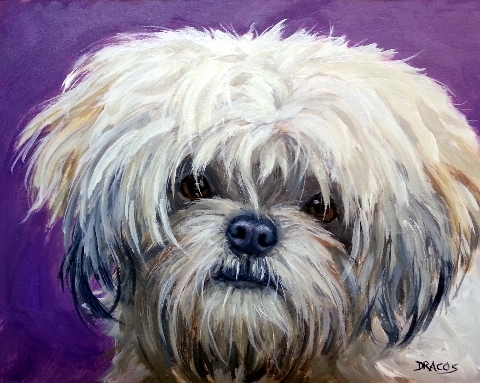 This is a little painting I finished yesterday at the request of a customer, who noted that I had neglected to paint this beautiful dog. 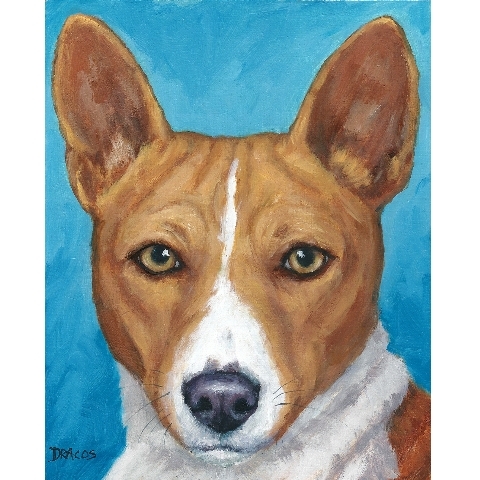 They are pretty little dogs, and I had actually painted one several years earlier, sold the original, and then due to a computer crash (and poor backup habits), lost the file of the painting. I didn't go to Portland Saturday Market this weekend due to weather. However, unless there's a storm or a bad case of flu or something equally calamitous, I'll be there. For those of you Portlanders who haven't been there in a long time, you need to come down and check it out. It's a beautiful place these days, right alongside the Willamette River. By the way, I must comment on something I overheard at the market last weekend: I heard a man telling his children who had apparently asked how we artists/craftspeople managed to be able to sell at the market. The man replied that one only had to pay a fee, and voila, one had a market business! Well, obviously, that's not at all true. Each and every artist/craftsperson at the market must go through a rigorous jurying process before we are allowed to sell there. And we must adhere to strict quality standards throughout our time at the market, too. Each of us there creates his/her own work, from start to finish, and we, as the creators of such art work, must for the most part be present to show and sell it. The Portland Saturday Market is comprised of a few discrete areas: First, the beautiful new area designed and built for us just a few years ago alongside the Willamette River, on Naito Parkway; this new area also extends back to and through the underside of the Burnside Bridge, too, due to the large number of people making their livelihood by selling their arts/crafts at the market. The third area is a quite large area across Naito Parkway from the new part of the market and stops at the fountain on First Street, where the Max passes. There are "tagalong" markets that have formed all around and even adjacent to Portland Saturday market who, when asked, most often say they are also "Portland Saturday Market." They are not, and much of their items for sale are not made by them, and if they are made by them, do not adhere to the market's strict quality requirements, and many of their items are imported from other countries. It's amazing the number of people who come into my booth and ask me where I buy my prints, paintings, who, despite the presence of my name on each and every painting, and the sign in my booth showing me working on a painting, don't understand that I paint for a living and that I love what I do more than anything. Okay, I'll get off my soapbox for now and head back out to the studio to work on another painting. 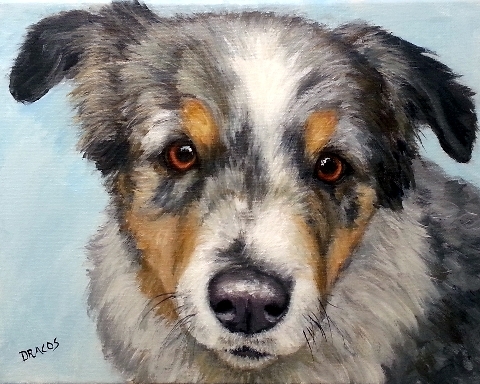 This is an Australian shepherd painting I finished a couple of days ago. He's one of four custom paintings commissioned by the first lucky person to take advantage of my once again taking custom orders. I'll try to remember the other three that I'll be doing: Let's see, there's an Australian cattle dog (aka red heeler), a Brussels griffon, and a golden retriever. I think that's all of them. I'll be starting the second one today, actually. I don't know yet which one I'm going to start first, though. I'm excited about doing the griffon; I've never done one before, and I think they are so very cute! And I've always been fond of the cattle dogs. Their head structure is very interesting to me. They're not necessarily very large dogs, but they have a good strong looking, muscular looking head. And, of course I love goldens. I've only had one in my lifetime, but he was a real sweetheart. He lived to be fourteen years old and was very special to me. And, well, Aussies, I've done so many of them that I feel as if I know them all personally. They're a bit difficult to paint, though, because every one is entirely different from all the others I've painted. This one pictured here, is of course, a tricolor with a lot of blue merle markings. I hear from his mom that I even made him look sweet!! I'm assuming he can be a bit of a stinker sometimes, judging from that comment. Okay. I've been baby-sitting all day (which I loooooove to do) while my daughter worked with her students at a dressage schooling show today. One of her students won first place, by the way! Now, though, it's time to go out to my studio and get to work for today. I didn't go to Portland Saturday Market today because the weather forecast was quite iffy, but it's been for the most part a beautiful day here in Beaverton and I'm sure in downtown Portland, too. Darn, deceived by the weather man yet again! 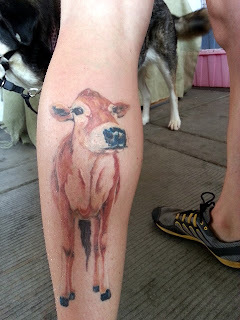 My Jersey cow Painting as a Tattoo!! This is one of the craziest ways I've ever seen anyone "pirate" my artwork (and in this case, I didn't even mind being pirated!). I was at Portland Saturday market late this past summer (yes, summer is officially over around here) when this young couple came into my booth and were looking at some of my artwork. Suddenly, the girl screeched with delight and pulled out the print of one of my favorite paintings, my "Sweet Jersey Cow." She then showed me her leg (photos above). She said she found my painting through Google images and fell so in love with it that she had it (plus a made-up body) tattooed onto her leg. It was a pretty amazing day, to be sure, and a lot of fun, too. Of course, I had to give her a free print after she went to all that trouble with one of my painting images. Sorry, I didn't get your names, young couple. And, also, I'm so sorry it's taken me so long to finally get this fun experience posted. Just too busy, I'm afraid. But anyway, it was great to meet you both. I realized that I had never uploaded a painting I did of my little sweetie, a pomeranian. So, Everyone, I present you Harry Barker!! He's for the most part a sweetheart -- except, well, when he's not: For instance, when he's barking nonstop at imaginary intruders, I want to muzzle him. But he's usually a well-behaved little guy, who realizes that his most important job in the world, besides staying by my side or in my lap constantly, is to alert the whole household if there's any (I mean ANY) potential danger out and about. He's a little large for a pom, weighing in at between 13 and 16 pounds, the weight variance depending on whether or not I've been too liberal with the treats or keeping him on a tighter regimen. And he's the hairiest pom I've ever seen. He's really just a little hairball, moving around with only his feet showing, so he almost looks as if he's a rolling hairball! Okay, now back to the studio to finish a custom Australian shepherd I'm finishing up. Yes, this is another Aussie, my fifth in just the past couple of months. They're beautiful but oh so difficult to paint -- and every one is different, too, with very different colors and markings. It should be finished today, and I'll upload it tomorrow. The rest of today my family and I, including my precious little almost-three-year-old granddaughter, are going to the pumpkin patch and corn maze -- and, of course, the farm store! on Sauvie Island, on the Columbia River, just outside Portland. It should be a fun day -- and, horray, the weather is going to cooperate! This is a fun painting I did a few months ago and I'm pretty sure forgot to post. I call it "Doxie Field of Dreams." 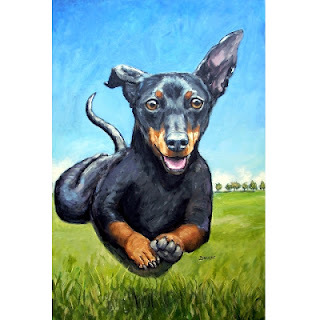 It's an acrylic painting on a 24x30" (3/4"-deep sides, no staples) of a black-and-tan dachshund seemingly flying over a grassy field. 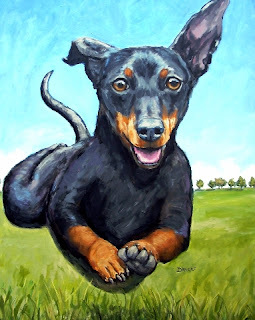 Actually, the dachshund wasn't really flying (really!!) but was moving along at a really fast clip and was caught by the camera as all four feet were off the ground. A happier dog I haven't seen in a very long time, and I think it well reflects the vivacity and energy of this small dog breed. Yesterday at Portland Saturday Market was a bit of a flop for me: If you don't know how the market works, here's a bit of info about it: It's rather complicated, so I'll try to stick just to the immediate facts. Due to a point system, we artists/vendors (who for one reason or another don't have a permanent space for the year) are allowed to choose our space for the day or the weekend dependent on our accumulated number of points. As a "returning artist," (I'll explain that some other time if anyone is interested), I have a small number of points and thus usually don't get a choice of a great spot (this year). I made a bad choice in the location I did choose, and it had a very strong adverse result on the number of people who passed by my booth yesterday. I just wasn't thinking but wanted to try someplace I had never been located, too. It was a big mistake, and my poor sales reflected that bad choice. Well, okay, it's only one weekend, and I know not to choose that location again in the future! Overall, though, it's been very good for me to have been at the market all these years I've been there. I get to "meet and greet" my potential customers; I get to see real-time feedback from customers, using what they say, their body language, what they look at most (and least), etc. It's a real education for the artist who pays very close attention and can help the artist (or craftsperson) determine what themes/items/sizes, etc. are most likely to please customers and thus create an income. I have finally started taking just a few commissioned custom painting orders again, so I'm going to be quite busy with them over the next several weeks and may not be at the market as regularly as I have been, but I will go at least every other weekend until the holiday season starts to kick in. Also, this time of year, customer traffic is generally slower than in the summer and holiday months, so it's a good time to get caught up on other work, such as custom work. Now to start on a customer's four - or is it five? - dog portraits! Wish me good painting! 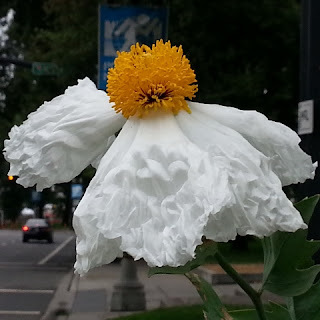 Here's the flower I talked about in my last post - the one that I spotted as I walked to Portland Saturday Market last Saturday. I'm happy with it and wish I could keep the original for myself -- alas, however, I have to make a living and so must put it up for sale. It's going to the market with me this weekend and will be listed on my couple of online venues (Artfire and Etsy) early next week. It's acrylic on a stretched canvas, 24x24x3/4", with the sides painted the same color as the background, wired and ready to hang as is - or, of course, with a frame if you wish. I have moved my studio from a room in my house to a shed outside my house to make space for a room for my little granddaughter when she spends the night with me. So far I like the shed: It's cosy, private!! !, "inspiring" (because when I'm there, I know I'm there to work and only to work, whereas inside my house, I always had "distractions" that could take me away at a second's notice from my work.) It was a good move, and my little sweetie loves her new room here. Well, off to the market for a soggy weekend, I'm afraid. For those of you who don't live in the Pacific Northwest, we have two seasons pretty much: wet and dry. We had a nice three-month of completely dry weather (no kidding, the weather service said we had an 87-day run of almost totally dry days, with a few precious raindrops that fell for literally minutes a few days in there - not even enough to get the yard damp. Now the rains have come! That means we'll see a very rare dry day - or part of one - until sometime next early summer if we're lucky. This past summer (meaning dry time) didn't start until sometime in mid July, which is a few weeks later than normal. Oh, well, everything will be green again in a few days before the really hard rains start and the colder weather sets in. I love, love, love being at Portland Saturday Market most of the time, but the rain can really "dampen" one's spirit. The bright holiday lights coming up soon, though, help to brighten things up again, though. Oh, here's a photo that I took of the above flower painting. 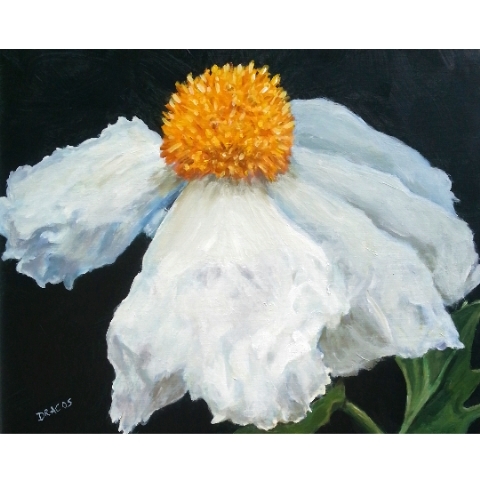 As you can see, I cheated a little on the painting, especially with an added petal to the right rear -- the photo looks too much like an angel as it really is; and while I like angels just fine, I didn't want anyone to think I was trying to paint an angel-flower. Just too cheesy for me, I'm afraid. Again, this flower was quite large, 3-4" diameter, I would say, and all alone beside a traffic control-type box on Naito Parkway, along the Willamette River here in Portland. A beautiful find! 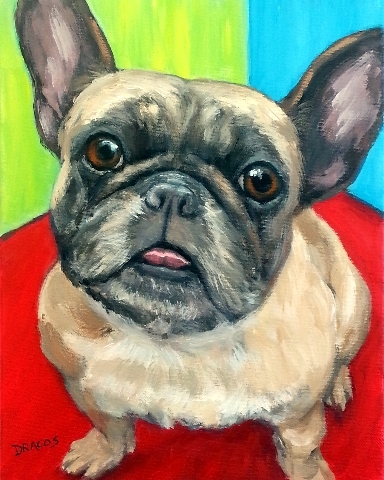 This is the other Frenchie I painted recently. The original is on 11x14x3/4" stretched canvas and, like the other one, sells for $100 (plus shipping if applicable). It's available at either of my online shops, Artfire or Etsy, as well as at Portland Saturday Market. I'm currently working on a painting of a beautiful flower I found alongside Naito Parkway as I was walking to the market last weekend. It was a single flower on an at least five-foot plant, and the flower was around three to four inches in diameter. It was absolutely beautiful. It was sitting all by itself next to some sort of traffic-control-looking structure alongside the street. Hope I can do it justice. I'll show both the photo I took and the completed flower when I get it finished.